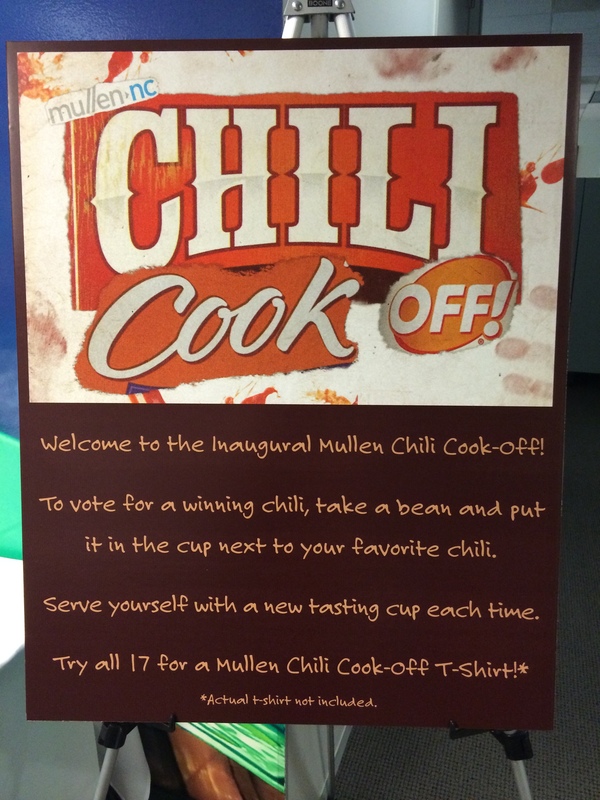 My office hosted its first annual chili cook-off event yesterday, and it was basically THE event of the season*. I’d never used dried mushrooms in a recipe, but like their addition in this dish. You can use any variety of dried mushroom, but I went with oyster. To hydrate, rinse dried mushrooms and add to a saucepan with three cups of water and bring to a boil. Remove from heat, cover, and let stand for 15 minutes. Drain mushrooms, reserving liquid stock. Filter stock through a cheesecloth before using. In a large saucepan, combine dried chilies, roughly chopped onion, and garlic cloves with enough water to cover. Bring to boil, then cover and reduce heat to a simmer for 15 minutes. While that pot simmers, heat a large stock pot or Dutch oven over medium-high heat and add olive oil, swirling to coat pot. Add soyrizo (removed from casing) and brown lightly, about five minutes. Add diced celery, finely chopped onion, and diced bell pepper, and salt liberally. Saute until vegetables are crisp-tender (another several minutes). Add diced hydrated mushrooms, chili powder, oregano, cinnamon, cumin, and agave, and cook until spices are fragrant. Add potatoes and sun-dried tomatoes, tossing to combine. Drain the chilis, onion, and garlic cloves, reserving one cup of liquid, and combine three ingredients and cup of liquid in a food processor. Puree until very smooth. Add pureed chilis, reserved mushroom stock, bay leaves, and 2 cups water to veggie mixture. Bring chili to a boil, then cover, reduce heat to a low simmer, and cook for 1 1/2 – 2 hours, adding salt and pepper to taste. Remove bay leaves and serve topped with cilantro. Yay for delicious, non-meat chili! If you’re looking for another recipe, the one I posted on my blog recently is excellent. You won’t even need a meat substitute.